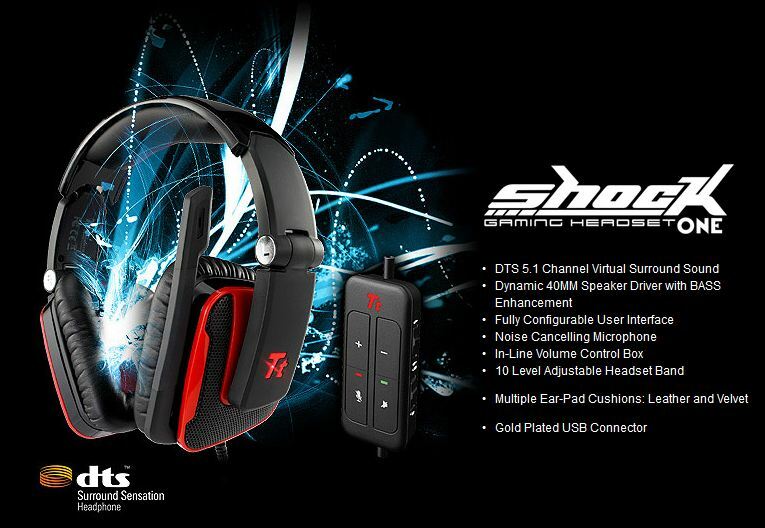 Tt eSPORTS are proud and excited to release the next edition of their Professional Shock Gaming Headsets, the “One” which is the most advanced headset in the range, which has many amazing features including DTS 5.1 Virtual Surround Sound and Dynamic 40mm Speakers that allow for high quality Bass Enhancement. The “One” has been designed to produce immense sound quality in-game as well as being able to offer a comfortable solution for gamers with it’s multiple Ear-Pad Cushions and leather headband pad to allow for multiple hours of wear for continuous periods of gaming. The Shock “One” offers gamers a professional gaming headset with USB connectivity, a fully configurable user interface and an illuminated Tt logo so you can be the “One” who stands out in the crowd at gaming events all around the world. When Tt eSPORTS created the Shock “One” gaming headset the idea behind the product was to fulfil the requirements of ALL professional and casual gamers who are enthusiastic about the equipment they use. The Shock “One” has been developed to enter a highly competitive market but by combining a visually fashionable design with high and exciting performance the product is sure to bring a smile to any gamer who invests.